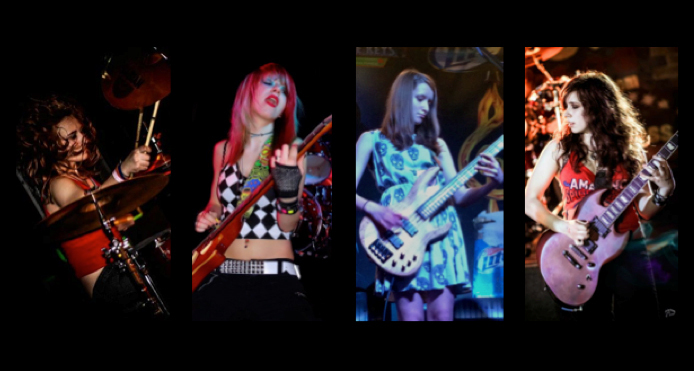 Bloody Mary is a Chicago-based, all-girl teenage rock band that made its performance debut in 2010. Known for their unique sound and impressive array of original music, this dedicated group of girls has performed at large venues like the Congress and Arcada Theaters and smaller, more intimate clubs like Penny Road Pub, Chicago Loop, Bannerman’s, and Brauer House. Bloody Mary has also made appearances at national events such as the NAMM (National Associaion of Music Merchants) and the Indianapolis Metal Fest for both 2012 and 2013. The band released their first CD “Coming of Age” in the summer of 2012 on the Dark Star Records Label and are currently working on their second album. Bloody Mary is: Hollie Wood on Bass/Vocals, Ana Apollo on Lead Guitar/Vocals, Rickee Divine on Guitar/Vocals and Kat Cannons on Drums/Vocals.